Cut the cost of heating your home. Energy efficient windows and doors from aluplast. Heat lost through windows accounts for around 25 per cent of the total heat lost from your home. Energy efficient windows and doors can cut this heat loss by up to 75 per cent. According to the Energy Saving Trust in a detached three bedroom home, this can equate to an annual saving over and above single – and in many cases, older double-glazed windows – of up to £160 a year in heating bills. There are two systems for rating the performance of windows and doors – U-values and Window Energy Ratings (WERs). 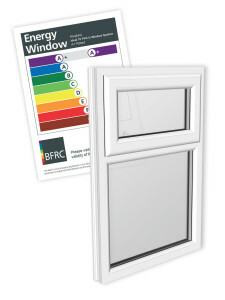 Window Energy Ratings give windows a ranking from ‘A/A+’ to ‘G’ using a ‘traffic-light’ type colour code. To meet building regulations, all new windows must achieve a minimum WER ‘C’ rating or U-value of 1.6 or less. Our energy efficient window and door system is built around a thermally efficient five chamber German engineered low maintenance PVC-U system. These chambers create a series of thermal barriers between cold air outside and warm air inside your home. It’s also been designed to accommodate the most energy efficient triple-glazed insulated units. These deliver a top A++ British Fenestration Ratings Council, Window Energy Rating. Want to find out more about how aluplast energy efficient windows and doors can cut the cost of heating your home?